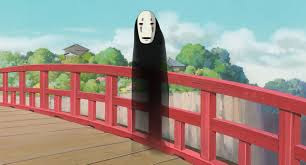 Spirited Away, by famous Japanese animator Miyazaki Hayao, is a fantastic feature-length film that focuses a sullen, willful, and spoiled 10-year old girl named Chihiro. The story opens with her in the back seat of her father's car, moping while they are moving to a new town. On the way, her father gets lost in a dark forest, and winds up at the gate of what appears to be an old amusement park, abandoned after Japan's bubble era. Although apparently abandoned, as evening falls, some of the food shops appear to open, and Chihiro's family find that they are lined with exotic, tasty delights. Chihiro's parents pig out on the food, scaring their young daughter, who just wants to leave. 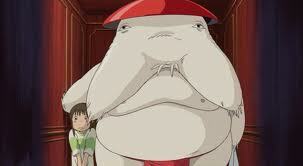 Within moments, Chihiro's gluttonous parents literally turn into pigs. Making matters worse, as twilight sets in, Chihiro finds the way back to home blocked by a vast lake. As night sets in, a boy named Haku appears as Chihiro's guide, and leads her to a towering bathhouse. 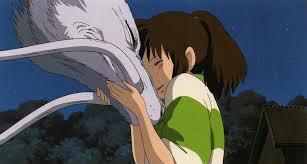 Haku informs Chihiro that to survive in this new world and to save her parents, she first has to work. Haku thus sends Chihiro to Kamaji, an intriguing, bearded eight-limbed creature who works in the boiler room deep in the innards of the boathouse. After seeing Chihiro's guts firsthand, Kamaji tells Chihiro that she must make it to the top of the bathhouse and demand a job from the proprietor and sorceress, Yubaba. From this point on, Chihiro ventures in to the bathhouse, only to get a first glimpse into a wondrous new world. In the process, her name is stolen by Yubaba; she is renamed Sen. And Chihiro/Sen begins a magical and extraordinary adventure to save her parents and to find a way back home. Chihiro is different from the heroic figures that populate some of Miyazaki's and many other animated films. In her spoiled and sullen way, Chihiro is a unique antihero. To save her parents, this antihero engages in a number of what a willful 10-year old girl might be consider Herculean tasks: exploring an old bathhouse; demanding a job from the proprietor; cleaning dirty baths; helping her friends; and riding the train alone. These seemingly ordinary acts are imbued with a magical quality, and allow Chihiro to guide the viewer through a world teeming with endless imagination. The adventures she has, the friends she makes, and the love she experiences ironically make this willful 10-year old at times feel much more adult than her own parents. 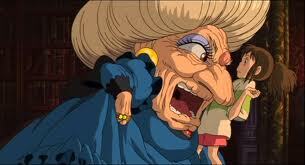 True to form, Miyazaki's also creates a subtle and layered antagonist, one who is not exactly the poster girl for evil. Yubaba is a complex character. Although overbearing, intimidating, and driven almost wholly by greed, Yubaba has a softer side that she reveals sporadically throughout the movie. Whether by her motherly softness, her praise for Chihiro, or through the occasional soft-hearted decision, Yubaba defies the simple caricature of evil incarnate. Yubaba's twin sister, Zeniba, is equally complex. She would not hesitate to kill to protect her magical properties, but at the same time she is kind-hearted and more than willing to take care of Kaonashi (No Face). The movie thus effectively blurs the lines between good and evil, presenting at times more realistic picture of life. 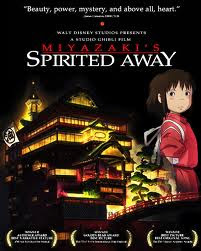 Miyazaki also uses Spirited Away as a vehicle to promote an environmentalist message in a surprisingly effective manner. After joining the bathhouse, Chihiro's first client is Okutaresama, a river god whose body had absorbed all the putrid sludge, stinking junk, and discarded objects that people threw in over the years. In this funny and delightful scene, Chihiro finds herself helping the river god discard all the junk it accumulated over the years. And Haku, her love interest, also has a an eco-unfriendly back story. Perhaps because these messages are told in a subtle manner (through side stories), the environmentalist critique in Spirited Away is more powerful than any other Miyazaki movie since his early masterpiece, Nausicaa of the Valley of the Wind. Spirited Away shows off Miyazaki's boundless imagination, enthusiasm, and endless creativity, both in its animation and in its overall story line. The animation stands apart from most other animated movies (especially Disney) because it is hand drawn with a degree of care that is rarely found in feature-length films. And the design is equally beautiful. I have never seen in one movie so many different types of plants, monsters, gods, and other beings. In the end, Spirited Away weaves a simple fairy tail of a young girl trying to save her family and return home. In doing so, it tells, in a surprisingly effective way, straightforward messages of the harmful nature of greed, the negative human environmental impact, the difficulties of growing up, and the importance of believing in yourself. Although not my personal favorite Studio Ghibli film (that honor goes to Porco Rosso), Spirited Away deserves lavish praise as Miyazaki Hayao's best, most complete movie. It never fails to put a smile on my face or a laugh to my day. This film is fit and fun for any age, from young child to adult. Run, don't walk, to your nearest computer to download or buy this movie. 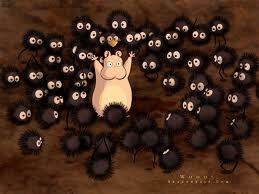 Spirited Away is without a doubt the finest animated film ever made. No Nerd Coefficient necessary. This movie rocks on all accounts. Total Score: 10/10 "Mind-blowing, Life-changing, Best. Animated. Movie. Evar!"